Er. 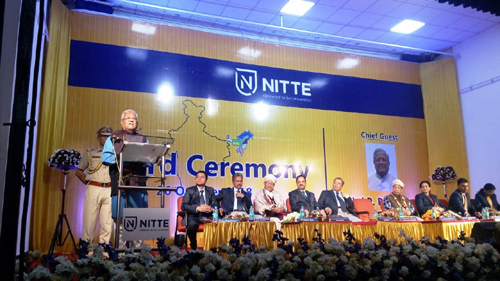 Latsam Khimun of Arunachal Pradesh and Ramkui Jeme from Assam were conferred Honoris Causa (honorary doctorate degree) by Nitte University, Mangaluru. They were awarded for tireless efforts over a long period of time in the field of social works in the northeast. The university considers the degree as a unique achievement for significant contribution to the society at large. Chancellor of Nitte University N. Vinay Hegde conferred the degree to the two awardees at a function held at the university auditorium in Mangaluru on Friday, PRO, Raj Bhavan, Kohima said in a release. The award ceremony was attended by Nagaland governor PB Acharya as the chief guest. Acharya, well aware of the valuable works contributed by Er. Latsam Khimun and Ramkui Jeme in the field of social works in the North East, had recommended their names for the award. Addressing the programme, the governor opined that people from all walks of life must be recognized by the universities for their selfless and unique services to the society and the nation. “Such conferment will encourage the dedicated and extraordinary individuals and also motivate many others to work towards sustaining cultural heritage, preservation of the fragile environment and overall prosperity and empowerment of every section of the society and gender,” he said. Acharya also stated that Nitte University was probably the first university in South India to recognize the important work silently done by the social activists outside the academic world.